Yesterday I had the privilege of guest speaking at a church on the topic of Getting to the Heart of a Child. My favorite topic. In my breakdown of Deuteronomy 6:4-9, I reminded parents of the necessity of being intentional. Of perseverance- impressing these things on our children takes time and patience. Of making sure that these things are in our hearts- we can’t talk about something we don’t know. We can’t model something we aren’t living. Of making sure that our actions line up with our words- but not to wear a perfect Christian mask. To make sure our kids see that we do mess up and when we do we try to fix it- we say we are sorry. We repent of wrong attitudes and hurtful words. As I looked into the sea of faces, I was reminded that many of them had kids who had left home. Who were living their own lives now. And many of those lives did not reflect what these parents had tried so hard to write on their kid’s hearts. And so I reminded us all that we never quit fighting for the hearts of our kids. We do not fight with them- we fight for them. Until our last dying breath we fight for them. 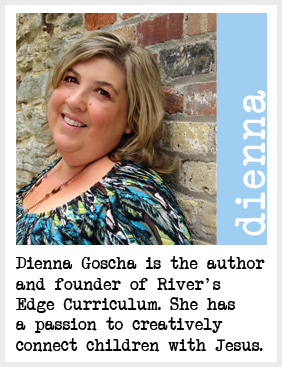 Our kids must know that we will never, ever, ever give up on them. That our relationship with them is too important. That our love for them is unconditional. That our desire for them to experience God will last forever in our own hearts. Thinking of you parents and kid’s pastors out there that are fighting for your kids. Don’t give up. Keep fighting for those relationships. For those hearts. Praying for any of you who might feel discouraged, worn down, perhaps even stomped upon. May God give you hope today. May He fill you with courage and resilience to keep on going. May you be filled with joy in the midst of the struggles. And may each child’s heart come to know His love, His goodness, His kindness, His mercy and His grace. Yes, His grace. Biblical Point: I can be generous and share with others. The story, The Rainbow Fish, provides a glimpse of the consequences of not sharing and later the joy of making the decision to share. As children see the Rainbow Fish learn to be generous, it teaches them this choice is one they too can make. It also gives some opportunities for dialogue about the best way to deal with other children who refuse to share. Children can learn that Jesus not only wants them to share but also to be generous in doing so. Sharing with a smile and a willing heart are the marks of generosity. Children will learn that even when their hearts do not want to share, they can ask Jesus to change their hearts so they will want to be generous. Today I have something wrapped. Do you know what it might be? It is a book. What book do you think is under the paper? 1. It is an animal. 3. It lives in the water. It is a fish. There are lots of different kinds of fish. Can anyone think of some of the kinds of fish we have in the world? Can you act like a fish? (Give kids an opportunity to show their fish imitations. )This fish is a colorful one. Let’s unwrap the book and see what we are going to read today. Have a child unwrap the book. This book is called The Rainbow Fish. 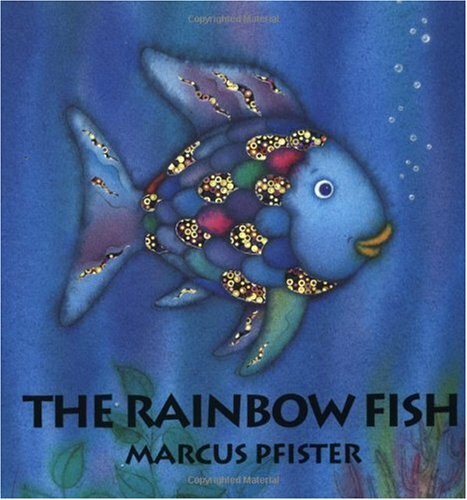 Did the Rainbow Fish want to share his scales at first? Why do you think he felt that way? How did the other fish treat him when he would not share? Were they right or wrong to treat him this way? What would have been a better way to act? Was the Rainbow Fish happier after he was generous with his scales? Do you think it feels lonely when we are selfish and refuse to share with others? We think it will make us feel good to have all of our stuff for ourselves but Jesus did not create us so we would feel good this way. He made us to be generous. Let’s make the choice to be generous with what we have. We can choose to share each day. This pleases God. Preparation: Mix a few drops of dish soap with the paint for easier cleanup. On your child’s hand, palm up, brush on different colored wide strips of paint using the paintbrush. Once the entire hand, including fingers is covered, press down on the paper. Allow to dry. With the marker, draw the eyes and the mouth. Paint waves with blue paint. Cut a fish shape out of the paper. 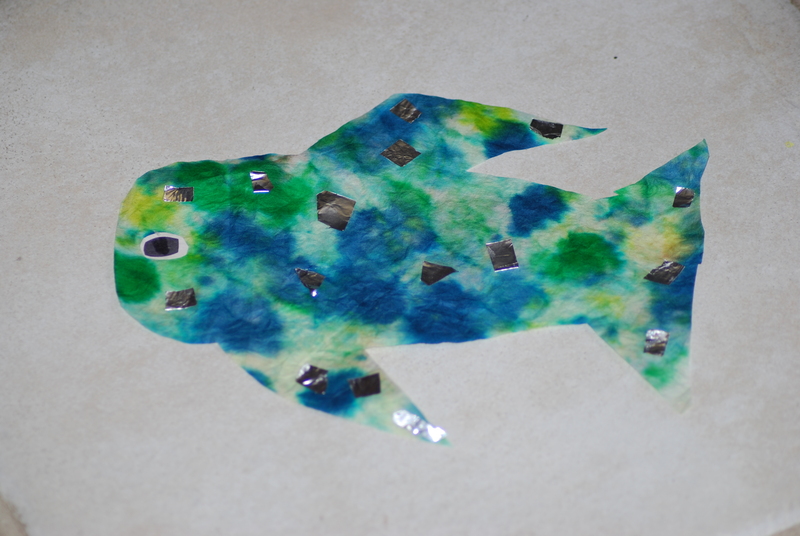 Have the child paint the paper with different colors to make the Rainbow fish. Allow to try. Cut small squares of silver for the scales. Glue them on the fish. Check out Dr. Seuss and the Bible to learn more about using books to teach spiritual concepts. Both classroom and home version available.